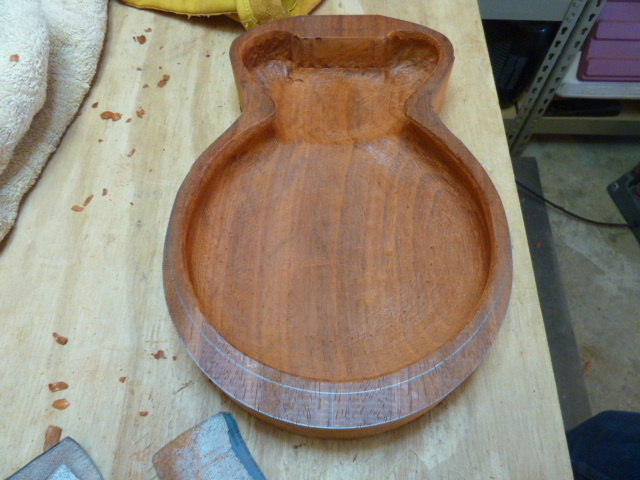 She looks a little like a candy bowl at this point but her semi-hollow body is taking shape. Our semi-hollow bodies start from a single block of wood. 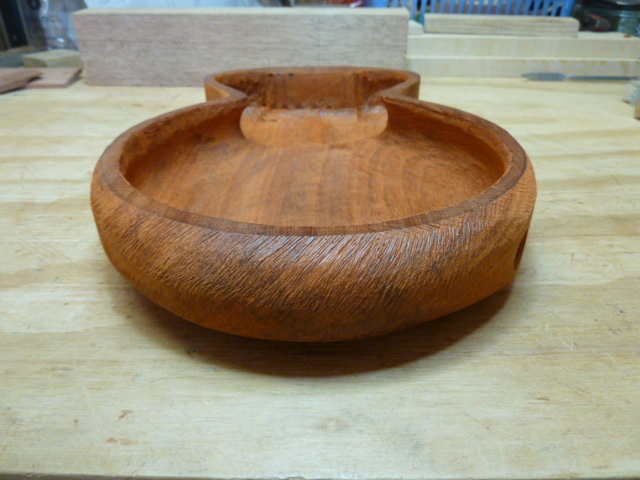 This is padauk. 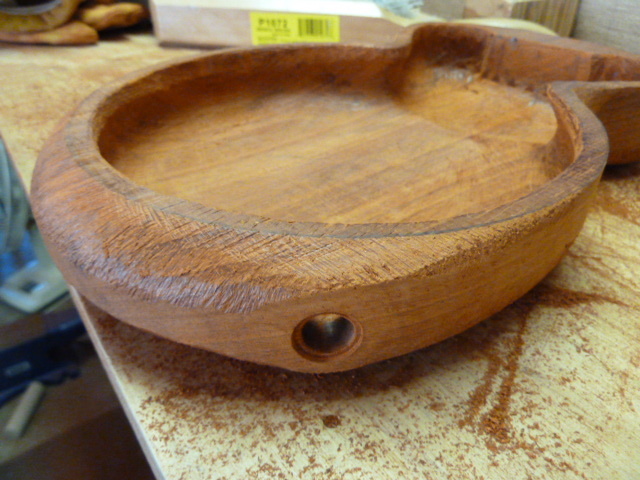 We actually start from the inside, shaping the inner cavity before we cut the outside shape. 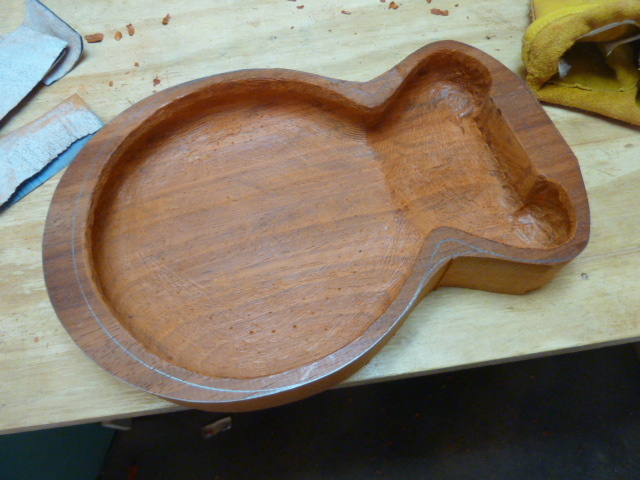 Padauk is pretty hard stuff so the final body will be extremely rigid. We undercut the sides so we can leave about a quarter inch wide edge for gluing the soundboard to the top. 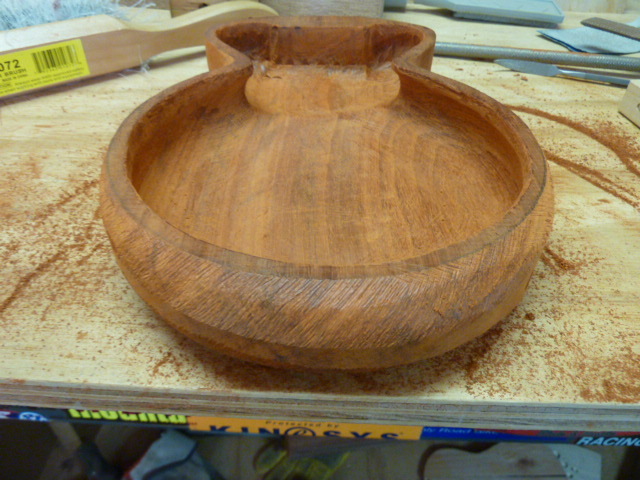 Once the interior is mostly shaped we trim the block to shape. The bottom edge is extra wide because that will be the beveled armrest. 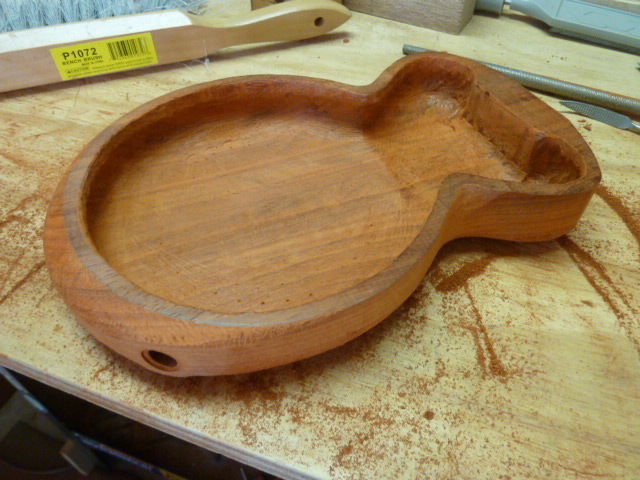 This is a soprano so the bevel is at the end instead of on the upper edge. You can also see the “neck block” in this image. 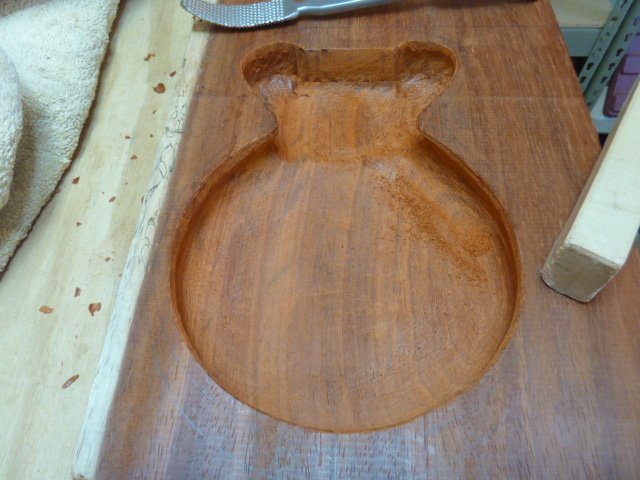 It will be slotted so the neck insets into the body. If you look closely there is a line drawn where the soundboard edge will be. So the wide edge at the bottom will be an armrest. Here the body has undergone significant shaping. 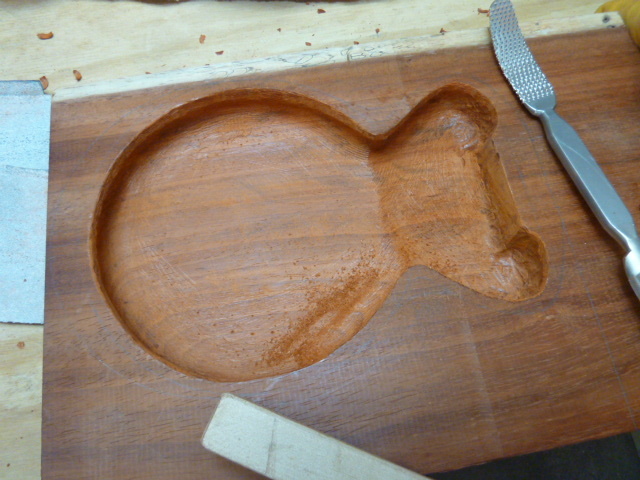 The armrest is shaped and the sides are rounded in. There will be no sharp edges on the body. Supreme comfort! This is the port for the pickup jack. We had to drill it early so we can shape around it. It would make a lovely candy bowl wouldn’t it? This shot gives a good view of how the edges are undercut. 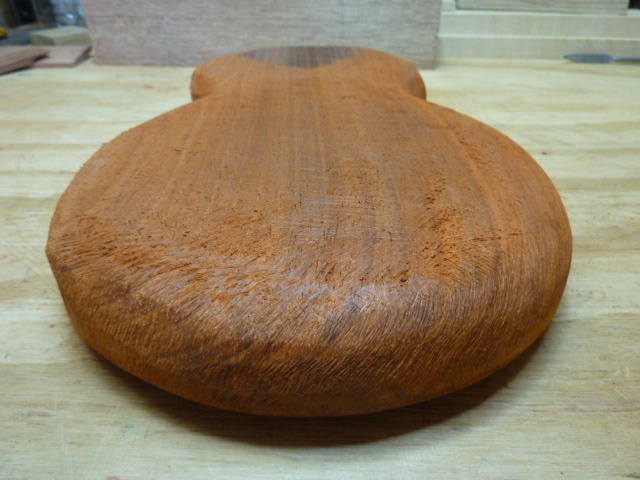 This will be one very very comfortable ukulele to hold and play.